These are the sites that I know are linking to my own site. If you're linking to me and I haven't noticed it, please drop me a line and I'll include you in the list. Britjes Favorieten - Netherlandish link collection. Carola's Dollhouses - Swedish collector of Lundby and other dollhouses. Claire Schaeffer - A great site about 1:144 scale. Hints, tool reviews, tutorials, DIY projects and photos of her work. Creativ-Seiten - Huge German collection of links, sorted alphabetically by craft (FYI, dollhouses is Puppenhäuser in German). Dockhus och miniatyrer - Swedish page on dollhouse miniatures. Dukkehus - Danish page on miniatures, with how-to's and links. Evas hemsida - Swedish page on miniatures and Boarding School stories. Fay Zerbolio's miniature needlepoint - Use the links at the bottom of that page to see more of her miniatures and needlework. 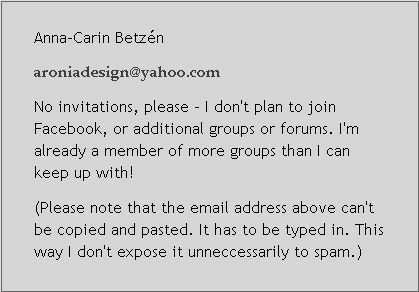 Helens hemsida - Swedish page on miniatures, knitting etc. Introduction to 1:48 - Quarter Scale Dolls Houses at About.com:Miniatures. Itty Bitty Things - Danish miniaturist working in various scales from 1:12 down to 1:144. Klein spul - Netherlandish link collection. Les Minis de Pitou - French site with hundreds (if not thousands) of links to miniature projects. Miniature Reality Links - Listings of miniature websites, shops, shows, magazines, online groups, and much more. Miniatyrsällskapet - The Swedish miniaturist society. Miniatyrvärlden - The Swedish miniatures magazine. MINIque MINIaturen - Netherlandish link collection. My Small Obsession - Links to smaller-scale miniaturists and dealers. Poohbeers.eigenstart.nl - Netherlandish link collection. Poppenhuis.2link.be - Belgian link collection. Small Serendipities - The late Pam Scott wass a great friend of mine, and a very gifted 1:48 sculptress. She used to publish the 1:48 scale how-to magazine Little Enough News; you can still order the back issues from her husband. Some like it small - Small scale dollhouse miniatures by Fran Sussman. Beautiful work, often using hardwood. She especially enjoys 1:120 scale, but she's also working in 1:144 and 1:48 scale. Her link page focuses on resources for smaller scales than 1:48. Skala Minimal - Swedish miniatures dealer (email). If you need 1:12 scale furniture to furnish a 19th or early 20th century Swedish home, she has a small production of moderatly priced authentic-looking furniture. Whiskers on Kittens - Photos of 1:12 and 1:48 scale miniatures, some how-to's, and a good collection of 1:48 scale resource links.